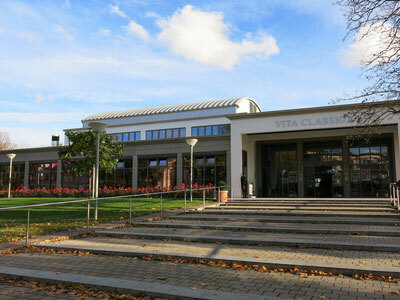 Entrance of the thermal bath Vita Classica: The mineral bath with its numerous spa facilities is worth a trip. As a center for wellness and health it offers lots of different spas, like Indian spa, Japanese spa, Turkish spa and others. Rare oils such as Argan oil or Ayurveda oil in combination with herbs and spices make a very pleasant combination, called wellness. In the Sauna Paradise you have the choice between Bio sauna, steam sauna, Finnish sauna and Japanese sauna. You can relax at the Japanese House. Afterwards returning to my vacation apartment Ruppenthal. Even at this time in winter, Bad Krozingen offers a lot of flat charges like fitness to recover your forces, wellness, and other flat charges. As you like in the sauna, thermalbath or relaxation room. Try and enjoy a different spas like a marrocan, indian, turkish spa. You could gain back your forces and healthiness, here in our thermalbad bad Krozingen.